Here at Conquest Joinery we supply Heat Treated wooden pallets to meet ISPM15 (International Standard for Phytosanitary Materials No. 15) regulations. Your delivered wooden pallets will be stencilled with their “Heat Treatment Passport” and we will also provide a certificate confirming their Heat Treated status. The stencil and certificate include a code depicting their country of origin, treatment code, unique registration number and the forestry commission logo – as shown below. 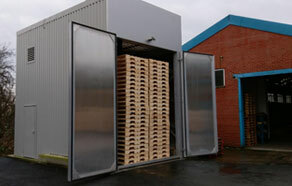 Heat Treated wooden pallets that meet ISPM15 regulations are a legal requirement if you are exporting your product on wooden pallets to North America, Canada, Mexico, China, Korea, Australia and New Zealand. This regulation is in place to prevent the spread of wood boring insects crossing international borders. ISPM15 (International Standard for Phytosanitary Measure No.15) is the internationally agreed standard for the treatment of all wooden pallets and packaging products made from solid wood. This Heat Treatment is necessary to eradicate any infestations held within the timber and is required to be carried out on all exported wooden goods to the countries stated above. 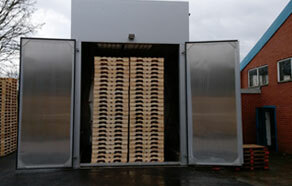 An increasing number of countries are also requesting this Heat Treatment on imported goods and ISPM15 is the process to prove this treatment has been carried out. All our products that receive this treatment are fully certificated to aid passage through customs and to ensure our customers that the products you are receiving are of the highest quality. The scope of ISPM15 is continuing to change and businesses using timber packaging must remain vigilant to avoid the risk of non-compliance. 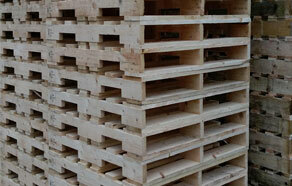 Please make sure that you receive the required certificates when buying Heat Treated wooden pallets. More information about ISPM15 can be found here.